A West End theatre has closed for two nights after bits of the ceiling fell down during a performance. The Theatre Royal Haymarket has cancelled Monday and Tuesday's performances of When Harry Met Sally after the incident on Saturday night. About 13 people suffered mainly cuts and bruises when plaster fell into the auditorium towards the end of the show. One woman is still recovering in hospital and the Health and Safety Executive is investigating. The Health and Safety Executive has said the chandelier did not drop four foot, as had been originally thought. "Nothing happened to the chandelier. It looked as though it had dropped but it hadn't," a spokesman said. 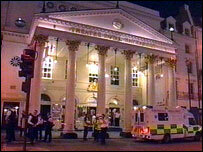 Theatre chairman Arnold Crook said staff were extremely concerned about what happened. He added: "We extend our sympathy to all audience members affected. Our experts are, at the moment, investigating the cause of the incident." It is expected performances will resume from Wednesday. The theatre has confirmed that the show's star, Luke Perry, jumped into the auditorium to help get people out of the building. Producer James Tod said one of the reasons he had chosen the Theatre Royal was the "renowned beauty" of the auditorium - the theatre's £1.3m refurbishment was completed in 1994.